New app: Imagine. Invent. Play! We’re so excited: The Everything Machine is here! Our new app lets kids dive inside their iPhone, iPad, or iPod touch to build their own machines with the device’s tools and sensors. 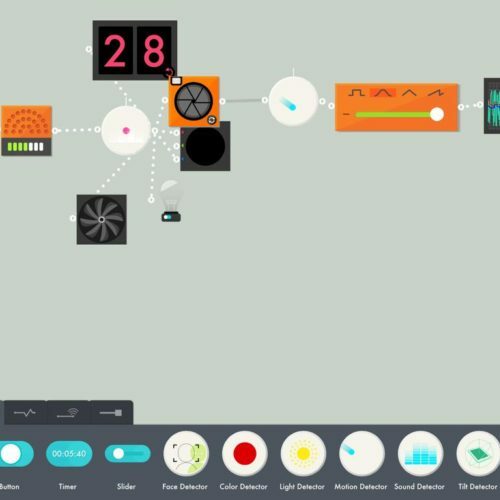 Kids can connect, control, and play with the camera, microphone, screen, speaker, gyroscope, and light using a visual programming language. To help everyone get started building quickly, we put together a short manual. Download it for free here or find it in your app. It has an introduction to the parts you can build with and a few example machines to test out. We also posted a few quick how-to videos on YouTube. This is the second app in our Digital Toys series. As with the first, The Robot Factory, we can’t wait to see what kids invent! We know some will build things that we didn’t anticipate and some things in the app may not work as you expect them to. We’d love to hear your wishes and suggestions for the app so we can add them to our (long and growing!) list of ideas. Email us at hi@tinybop.com. Or post a video or note and tag it @tinybop or #tinybop. If you and your kids love The Everything Machine, please leave a review on the App Store. It helps us out a ton: we love hearing from you, and we’re always listening carefully. Your feedback helps us make even better apps. We can’t do what we do without you. Thank you! We couldn’t be more thrilled with the response to The Everything Machine. It’s a Children’s Technology Review Editor’s Choice and an App Store Editors’ Choice! Best of all: y’all are building some pretty incredible machines.